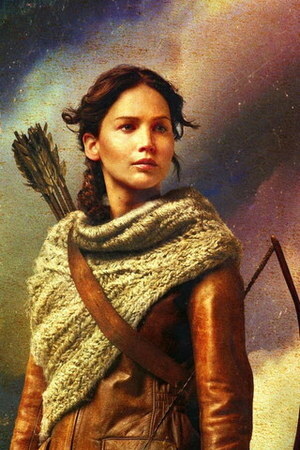 I saw that Rachel was looking for a pattern for the cowl from the new Hunger Games Movie. Now first of all I was surprised to find out what “The Hunger Games” is all about. To be honest I always thought “The Hunger Games” was some kind of series about teenage girls trying to gain size zero and being anorexic. This was why whenever someone mentioned the books I thought: well I’m not going to read something like that. But yesterday I realized that it is the series that in German is called “Die Tribute von Panem”… So reading Rachels post made me not only realized how wrong I was, it made me buy the first volume of the Hunger Games and I saw that beautiful cowl Katniss is wearing in the new movie. I liked the cowl so I thought I might as well go on a quest to design something looking like this cowl. The construction was quite clear to me from the beginning. 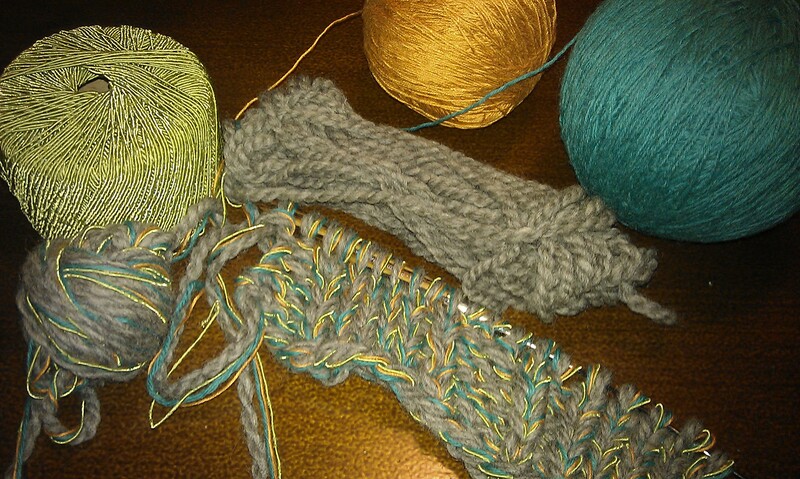 I wanted to knit two triangular lower parts for front and back. Then I wanted to knit a third part to create the middle piece and then maybe crochet the top. 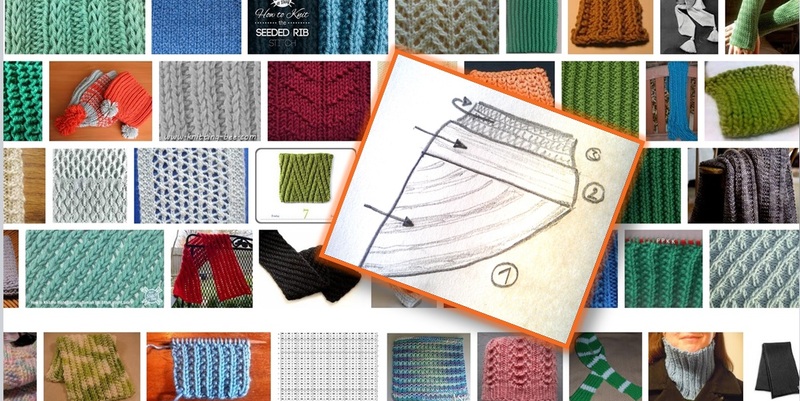 So first of all I was going through patterns to find something similar to the ribbing on the lower part. I marked some patterns and then went through my stash. 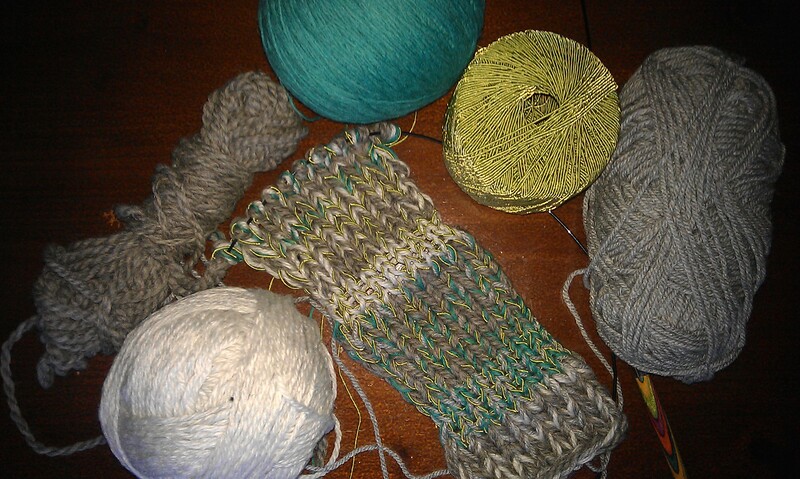 I wanted a thick fabric and some mottled effect so I took several yarns from my stash and began mixing. I knew I was going for grey as the general coulour and tried mixing several grey stash yarns with each other then with several thinner yarns in different colours. I knew I was not aiming for something exactly like in the picture from the movie. 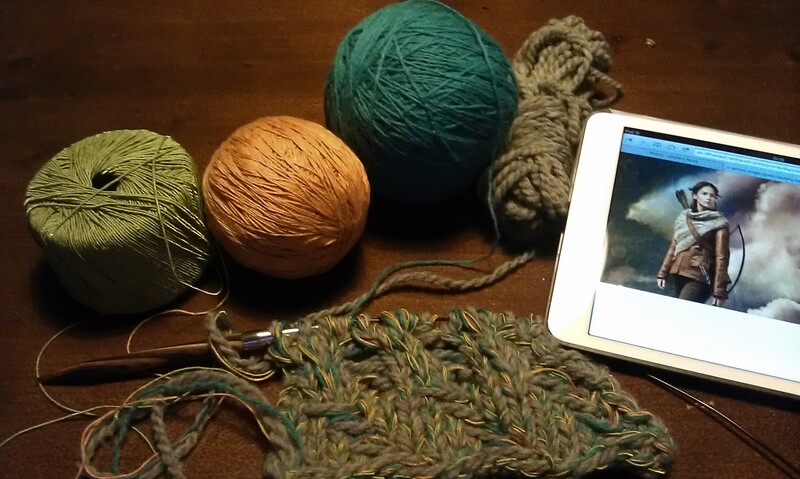 After checking several mixes I ended up with something that really pleases me: A think grey woolen yarn, mixed with a thin turquoise wool, a bright green silk mix and a very thin orange cotton. It is nice and squishy and the colours get a nice bright effect with the dark grey. Then I tried out the different patterns. I needed a ribbed pattern that I could knit diagonal to create a triangle after I tried different things like going for a heringbone stitch but they all didn’t really create the look I needed. I then tried a simple knit x purl x and that looked far better. After about 10 trial runs I ended up with *k4,p1,k1,p3, k1, p1 then repeat from *. And to get it diagonal I’m moving all knit stitches one to the left after I decrease one stitch on the right in every second row. When I’ve finished I will write down exactly what I did. Having found my pattern it was now time to measure gauge and calculate. I think starting with 45 stitches for the long side I’ll end up with a few stitches for the short side’s shoulder part while having achieved the width I need. I cast on the amount and we’ll see how it’ll end up. Now it means knitting, knitting, knitting. But with a mix of four yarns and EU size 9 needles that should be a quick knit. It is only the shifting of the ripping that takes a bit of time. Stay tuned for the next steps of the quest for the Hunger Games Cowl. I’ll keep you posted! Update: part 2, part 3 and part 4 are out too. This entry was posted in Knitting & Crocheting and tagged Cowl, Hunger games cowl quest, Katniss, Knitting, Pattern by kathatravelling. Bookmark the permalink. I’ve seen several patterns for this cowl, but I think the photo of yours is the best looking. I like the way it lies and also the way it drapes over the shoulders. Very nicely done! Now that I have seen the poster the cowl you are making is spot on. Nice job. *CLAPPING*!! I have started a trend here, there’s even a Ravelry group on it now! Keep me posted!